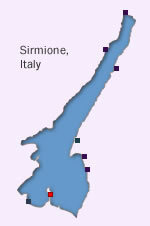 At SirmioneItaly.com, we recognize that privacy of your personal information is important. Here is information on what types of personal information we receive and collect when you use visit SirmioneItaly.com, and how we safeguard your information. We never sell your personal information to third parties. Like most other websites, we collect and use the data contained in log files. The information in the log files include your anonymised IP (internet protocol) address, your ISP (internet service provider, such as AOL or Shaw Cable), the browser you used to visit our site (such as Internet Explorer or Firefox), the time you visited our site and which pages you visited throughout our site.